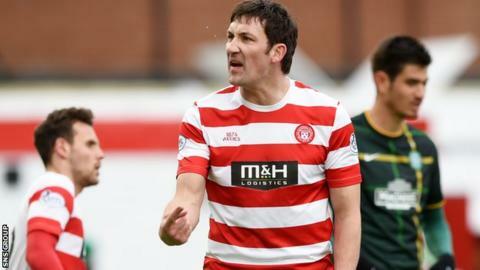 Martin Canning insists he will have no trouble combining playing duties with coaching Hamilton Accies. The defender dropped himself to the bench for his debut in charge against Dundee United but started in Saturday's 2-0 defeat by Celtic. "I watched the Celtic game back and my thoughts then were pretty similar to the thoughts I had while playing." Canning, who stepped up once Alex Neil left for Norwich City, has yet to declare if he wants the post permanently, while the Scottish Premiership club will accept applications up until Wednesday. He will therefore definitely be in charge for the midweek trip to face Partick Thistle. "Striking the balance between being a player and a manager will be difficult, but it's something I will just have to deal with," explained defender Canning. "I know having spoken to Alex that it was something he found difficult to start with, but Saturday has proved to me I can do it if this is something I'm going to carry on doing. "I know other guys have decided they can't manage both, but at the minute I think I'm still able to offer something as a player. "I still see myself as a player and I want to be out there. "I don't know how the board are thinking and whether they would prefer someone to be fully concentrated on managing, but basing it on the short period I've been here, I don't think playing is effecting how good a job I'm doing. "The first week against United I didn't play because I'd had a lot to take on in such a short space of time. But I had a full week to prepare before the Celtic game and I didn't feel it affected me at all." Canning has suffered two defeats in his interim coaching role and faces competition from more than 60 hopefuls who have already put their names forward - including former Rangers midfielder and Italian World Cup winner Rino Gattuso. "It's testament to the success the club has had that we have now got all these big names being linked with the job," added Canning, who has given his captain's armband to goalkeeper Michael McGovern. "When you hear names like Gattuso then it is great for the club and the exposure it gets. It says something is going right."